Technology plays a part in any organisation these days in order to speed up and ‘make easier’ various business processes. Can you imagine that behind the scenes of Amazon.com there is a huge department of people shuffling manual paper orders from one desk/department to the next? Perhaps it could be done this way, but your batch of DVDs you ordered would take several weeks if not months to arrive, and would probably be ten times the cost to cover the huge labour force required. No, behind the scenes is a highly integrated and complex system to cover taking orders, processing payments, carrying out stock control, arranging delivery, keeping the buyer informed of the status of their order, right up to intelligently looking through the vast catalogue of goods and services to recommend suitable things the buyer may be interested in in the future. And all this is done so efficiently that it is usually taken for granted by the buyer, sat at home with a credit or debit card. A business system is often viewed from two perspectives. Firstly, from a purely business sense, the system describes the various business functions and processes that combine together for the day to day running , i.e. 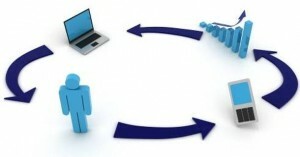 order taking, stock control, promotion, delivery … From a technology point of view, ’business system’ is usually used to refer to the databases and computer programs interconnected to achieve those functions and processes. The technology used varies greatly depending on the type and size of business and what business function the technology is used for. I’ve seen and been involved with small applications using Microsoft Excel or Microsoft Access for example to process orders, check quality/strength control of concrete products, control a small fleet of ‘pool car’ vehicles and other things, it’s not just for crunching numbers. For larger scale operations of course, dedicated databases are used such as Microsoft SQL server, mySQL (typically for web based business systems) with the interface for the user produced using Microsoft DOTNET technologies or HTML/PHP for online applications. Right at the other end of the scale, multi million dollar SAP installations typically run large organisations such as the international building products and cement company Cemex, or energy supplier KazTransOil based in Kazakhstan. A typical SAP installation may require many months (or even years) of consultation with business users to fully understand how that business works before implementing a computer system to serve its needs both for now and the future. It’s important for a business to design and choose carefully the system and technology to use, but at the end of the day as long as the business system works to help automate and simplify the internal working of a business, then it’s doing it’s vital job well !